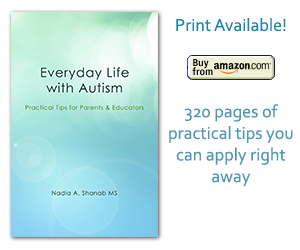 Autism Tips | Everyday Life with Autism » Blog Archive » Parents & Educators, Are You Ready for A New School Year? Parents & Educators, Are You Ready for A New School Year? A new school year is around the corner and about to emerge! Parents and educators are you ready? Here are some tips to help you get off on the right foot. To achieve these goals, parents cannot work in isolation, away from school and community. It is a teamwork, where members empower each other. Parents make sure your child is in the right placement the earliest possible. Ask for an observation/visitation to your child’s new program/classroom if you haven’t already done so. Co-operate with the school staff to achieve the best outcome. How? Communicate regularly. However, try to be brief, specific, and open to listen. Keep a correspondence notebook going back and forth between school and home to keep updating each other. Offer as many useful information as you can to the staff, who will be in direct contact with your child. Share any strategies to help the staff wisely handle your child’s behaviors. Provide any materials or resources that would facilitate the staff’s job. Volunteer whenever you can. Even half an hour a week can make a substantial difference. Your presence in the classroom and on the playground is highly appreciated from both: your child and the staff. Autism is a neurological developmental disorder. As I am writing these words, the cause(s) of autism remain unknown. There is no cure thus far, however autism became a vital research topic across the world. Schools cannot cure autism. Nevertheless, educators can help your child progress and advance every single day. The educators’ mission is very complex. They are supposed to teach academic subjects while managing the child’s behavior in a friendly and safe environment. Individuals with autism love having a routine and a discipline in their life. Let’s take advantage of this huge value. I know that some people are now wondering: Aren’t we supposed to train them to break the routine to render them more flexible? Yes, but this is another battle in a different context that I’ll talk about it later. Make sure to have a daily schedule for the best use of time. Consistency is the key to success. Avoid confusion by always applying the same rules. Home and school should agree on that. Children with autism, like all childen of the world, grow, develop, and prosper at their own pace. Be patient and work on the child’s strengths, not her weaknesses. Have a prosperous and successful school year 2013-2014!